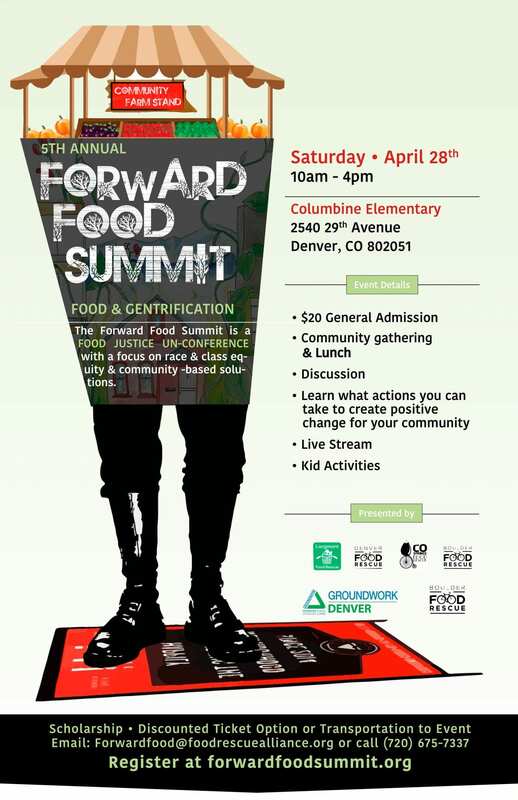 The Forward Food Summit is a food justice un-conference with a focus on race and class equity and community-based solutions. For the fifth annual summit, we are focusing on the intersection of food and gentrification. All are welcome at this inclusive event, where childcare and Spanish interpretation will be offered. Scholarships are available. Join us as we explore this ever-relevant topic, and hear from a diverse group of presenters, many of whom are experiencing the issues we seek to address. This is a time to explore root causes of injustice, poverty, and oppression, through a food-oriented lens. 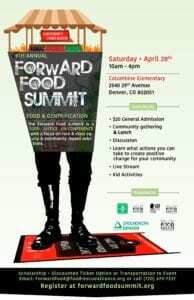 The Forward Food Summit is hosted by Food Rescue Alliance Chapters in Denver, Boulder, Colorado Springs, and Longmont. Interpretation, childcare, and transportation available.